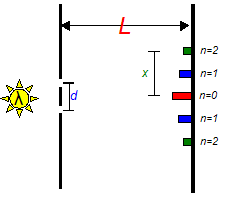 If light is a particle, then only the couple of rays of light that hit exactly where the slits are will be able to pass through.Since they are little particles they will make a pattern of two exact lines on the viewing screen (Figure 1). Notice that at some points the two sets of waves will meet crest to crest, at other spots crest meets trough.When this experiment is performed we actually see this, as shown in Figure 3. Example 1: A pair of screens are placed 13.7m apart. A third order fringe is seen on the screen 2.50cm from the central fringe. 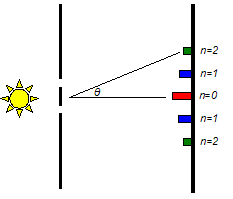 If the slits were cut 0.0960 cm apart, determinethe wavelength of this light. Roughly what colour is it? Light from different ends of the slit will be traveling to the same spot on the screen and reach there either in or out of sync.If they meet crest to crest or trough to trough they will be in sync, but if they meet crest to trough they will be out of sync. The result is the same interference pattern, although the effect isn’t nearly as dramatic or clear as the double slit experiment.The only real difference in calculations is that "d" is now the width of the single opening.